The French Open at the Roland Garros stadium in Paris is one of the year's most hotly anticipated professional tennis tournaments. Thousands of people flock to the renowned stadium in May and June every year to get a glimpse of standing champions or up-and-coming players in action on the red clay courts. The tournament harks all the way back to 1891 (although the current stadium wasn't built until 1928) and has served as the stage for countless breathtaking-- and record-breaking-- moments in tennis history. Tennis enthusiasts should do their best to snag a seat at the French Open, but be aware that tickets are always coveted and can be very difficult to get your hands on. This year's tournament will open toward the end of May and culminate in eary June, promising three weeks of exciting matches between numerous global tennis stars. Among those slated to compete this year are Indian Wells, Rafael Nadal, Naomi Osaka and Belinda Bencic. You can see the match program here. It's generally posted sometime in late March or April each year. Dates: Sunday, May 26th through Sunday, June 9th, 2019. ​Where to Buy Tickets For Matches in 2019? Again, it's extremely difficult to secure reasonably priced seats unless you book well in advance. If it's your dream to don a wide-brimmed hat and sit in the bleachers overlooking the famed clay courts, we highly recommend that you attempt to reserve seats several months ahead of time. You can visit the official ticketing site to try your luck. Who Won the French Open in the Past? Even if you can't make it to a match, the Open has seen many glorious moments and winning streaks worth learning about if you enjoy statistical improbabilities-- including Spanish player Rafael Nadal's streak as reigning champion in the Men's Singles category in 9 out of 10 attempts between 2005 and 2014! Find out who won the French Open at Roland Garros in past years here, and get a sense of the tournament's history and key highlights. 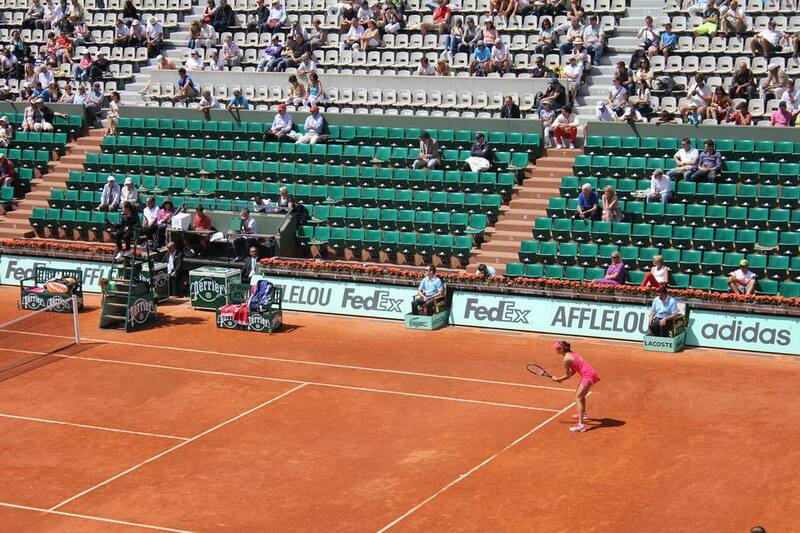 Where Else to Watch French Open Matches in Paris? Let's face it: not everyone can afford those coveted tickets for stadium or courtside seats at the Open, and even if you could, they're very often sold out before you get a chance to snag 'em. Luckily, there are other ways to enjoy the matches in a fun, public spirit in Paris. Many bars around the city will be playing the most important matches, from semifinal and final singles to doubles matches. Amble into any corner sports bar on the night of a match you're interested in seeing, and you're likely to find it playing. Some years, a giant screen deployed at Paris City Hall (Hotel de Ville, metro Hotel de Ville) broadcasts the major matches in the open air. Even better? It's entirely free. Bring a picnic and enjoy. There's unfortunately no word yet on whether screenings will be happening in 2019, but stay tuned for updates.